The 49ers won the final Battle of the Bay series against the Oakland Raiders in a Thursday Night Football prime time matchup by a final score of 34-3. The final nail in the coffin came at the hands of Nick Mullens, the 49ers third string quarterback and regular member of the practice squad. Raiders head coach John Gruden was less than thrilled as he could be seen on the sideline with many of his signature "Chucky" facial expressions. Mullens got the start in place of injured quarterback C.J. Beathard after it was revealed that he injured his throwing hand last Sunday in the loss to the Arizona Cardinals. Throughout the short practice week he was unable to grip and throw a football until Thursday. Head coach Kyle Shanahan said Beathard's status was truly going to be a last minute game time decision. With a little over two hours until game time, the decision was made to start Mullens in place of Beathard. Beathard would sit and be available as the back-up if needed since the 49ers released quarterback Tom Savage that same day. Mullens, a completely unknown quarterback if you did not follow his college trajectory from Southern Mississippi in Conference USA to his undrafted status as the 49ers practice squad quarterback, finished the night with a 151.9 passer rating, 16 of 22 completion, 262 yards and three touchdowns. In his debut, Mullens showed a level of confidence and poise that Beathard has rarely shown in his 11 games as a starter. Though he was inserted into the starting role on a night the 49ers faced an awful Raiders defense, no one was really expecting this kind of performance and no one can say that he wasn't impressive. Let's look at where he thrived and what needs improvement. Right out of the gate, Shanahan put Mullens in shotgun to give his quarterback an easier time at diagnosing coverages along with quick throws followed by a hard play fake that fooled the entire Raiders defense. Mullens found WR Pierre Garçon wide open for the touchdown. The next series started out the same way the first one did. Get Mullens in a rhythm and let him get comfortable with quick easy throws. What happened next surprised everyone. The 49ers lined up in 11 personnel and put Mullens under center with tight end George Kittle (No. 85) in a wing spot, and Richie James (No. 13) and Garçon (No. 15) split out left. The route concept is a "dagger/seam" concept to the left with Garçon on the "dagger" route (dig across the middle) and James on the inside seam route up the hash. Mullens motions Kittle to a fullback position, which pushes the defense into a cover two shell to protect against the deep throw. Mullens executes a hard play fake to running back Matt Breida (No. 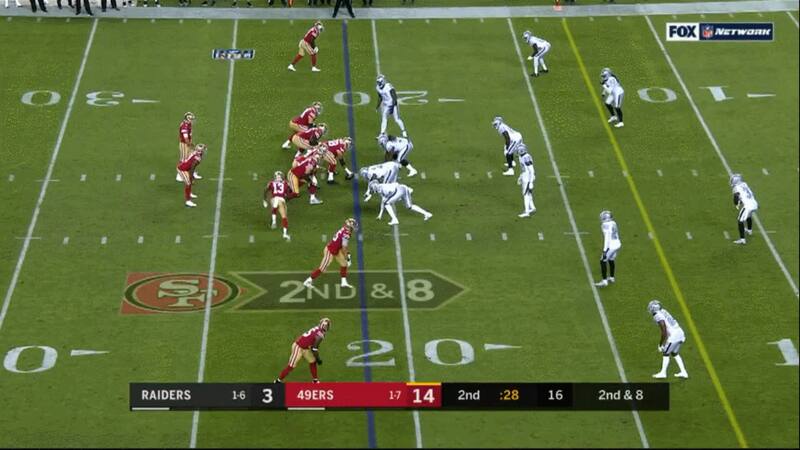 22) and draws the defense up just enough to see a zone open up behind the linebackers. The route combination works perfectly in tandem to pull the zone apart but Mullens notices right away that there is no throw to the deep middle down the seam with the safeties sitting back. Instead, he looks to Garçon as the zone opens up in front of the seam. To make this throw work, however, he has to release the throw at the right moment with enough air to clear the linebacker dropping into coverage underneath the throw. He does exactly that and hits Garçon over the middle for a 25-yard gain on second-and-9. Almost every throw that follows could fall under this category of on-time throws as some of his best throws came when he made quick decisions based on the coverage and knowing where the routes would develop. But some of his throws show other traits that he exhibited. Every great coach has a variant of the run-pass option (RPO) in his playbook. Kyle Shanahan is no exception and the RPO sweep is one we have seen in recent weeks, albeit not from Shanahan. In a copycat league, no one does it better than the Chiefs and Eagles. So why not borrow their concepts? This is one the Chiefs have run a number of times with Patrick Mahomes. Out of 11 personnel inside the 15 yard line, Mullens motions Richie James into the back field to diagnose the coverage. Shanahan hasn't had a quarterback since Robert Griffin III execute a "post-snap read" RPO and he doesn't on this play. Mullens sees that the motion of James shifts the coverage and a defender follows to the other side as the linebackers tighten to the formation. He determined right there during the pre-snap that he would go to the backside slant to tight end Ross Dwelley (No. 82). The defense is balanced in such a way that Mullens could have decided to hand the ball off to Breida on the sweep and they probably would've picked up good yardage due to the box count on the right side matching the total blockers the offense had. However, why not take a more aggressive approach? Mullens executes the play fake and draws the linebackers up just enough before he pulls the ball out and fires a strike to Dwelley on the back side slant, showing off quick decision making and accuracy. Later in the game, we get two more examples of the combined coaching scheme and quarterback ability to diagnose the correct pre-snap decisions on two different throws to Richie James late in the second half. 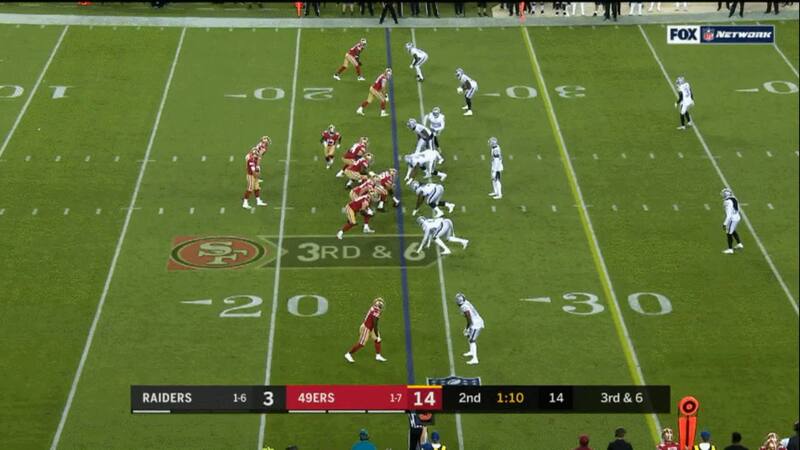 The favored personnel grouping of the night was 11 personnel and the 49ers are in it again here on a third-and-6. 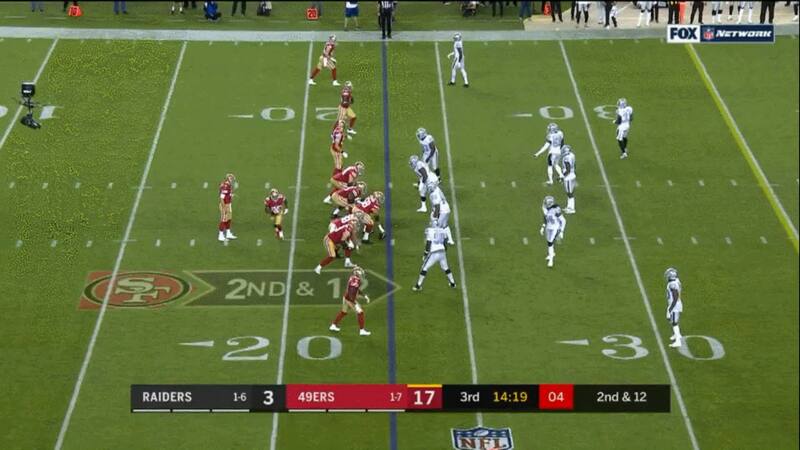 The 49ers start out in a "gun near trips left" and motion to a two-by-two with James as the motion man. 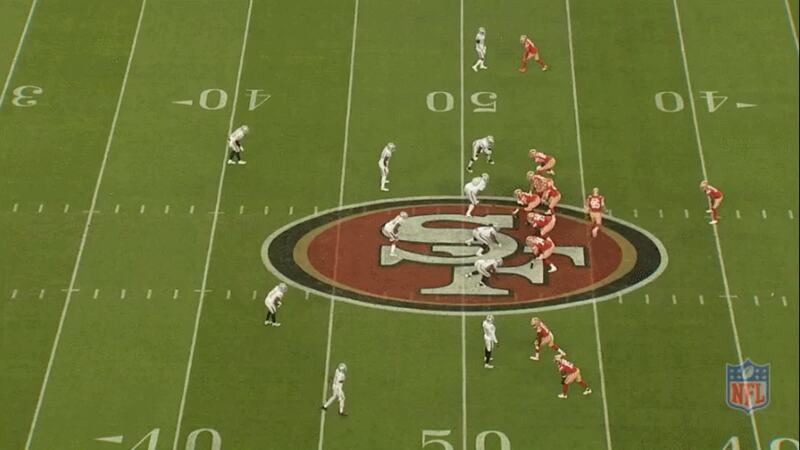 The Raiders are in a cover two man shell with the safeties outside the hash. The defensive backs are in press coverage, man-to-man, and the motion confirms this as James' defender follows him to the other side. The pre-snap defense begins to tip its hand and shows signs of an impending blitz from the nickel defender as the far deep safety begins to cheat over the far slot receiver. Meanwhile, the near safety begins to cheat toward the middle of the field, revealing a cover one shell. James' defender takes outside leverage on him to keep him from running down the seam with no safety help. However, the 49ers have other ideas. Mullens scans the field just before the snap and sees the shift in the defense and the blitz coming from the left as the middle linebacker creeps up into the box. As he catches the snap, he sees the void in the middle of the field and he immediately looks right and fires over the middle on the quick slant to James. James takes it up field for a 53-yard gain. 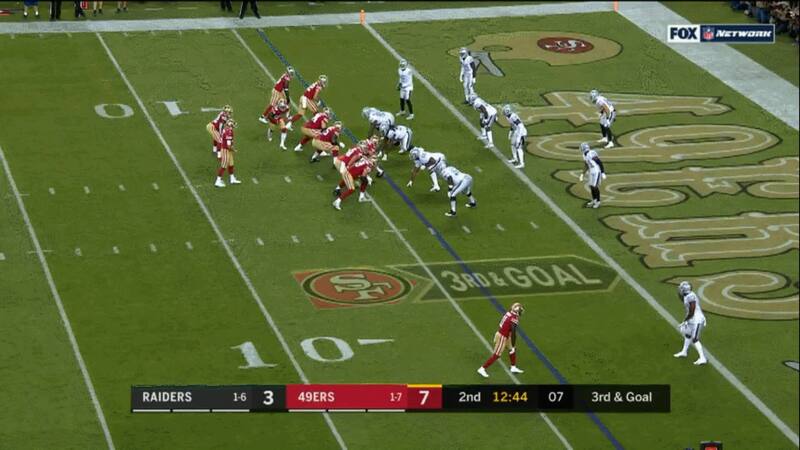 Three plays later on the same drive, the 49ers flip the formation and run the same exact play to Richie James again. The Raiders see the same motion from trips to a two-by-two formation and the same 11 personnel grouping on the field on a second-and-8. They're initially showing a cover two shell again but this time they walk a blitzing defender down into the box on the side that James motions too. Shanahan and Mullens again get the look they want. The Raiders rush seven against Mullens, leaving the coverage one-on-one in a cover zero look against the four receivers. The Raiders again tip their hand and show Mullens that he has a very good one-on-one inside match-up on the quick slant behind the blitz off the edge. James gives a quick outside move and gets the defender to open just slightly to the outside before he cuts back inside on the slant. The quick move gives him some separation and gets Mullens enough room to fit a pass into him in stride. However, James turned up field to run before securing the pass and dropped what would have probably been a touchdown. Mullens also displayed an ability to manipulate coverages to get the throwing lanes he wanted. On a previous play, Mullens had a route combination consisting of a deep out with a short slant underneath it. He was a tad late throwing the slant to Marquise Goodwin (No. 11) and his pass was nearly picked off in the end zone by Raiders cornerback Daryl Worley (No. 20). It goes through Worley's hands, Goodwin's hands, and Kendrick Bourne's (No. 84) hands before falling incomplete out of the back of the end zone. But the play revealed a tendency by the Raiders. Any time they were faced with a two-by-two set out of shotgun, their defenders would play an outside shade to take away the deep outs, seams, or corner routes from the slot, all favorite routes by Shanahan. On the next play, Shanahan exploited this. Mullens motions Bourne away from the trips bunch to the left and the defense shifts with the motion. Bourne's defender again takes away the outside by lining up with outside leverage to prevent any route from heading toward the corner of the end zone or the front pylon. As Mullens drops back, he scans the defense to his left and gets the underneath coverage to shift direction to its right side. Linebacker Tahir Whitehead (No. 59) funnels toward the direction of Mullens' eyes and begins to open up to his right. As soon as he starts moving that direction toward the hash, Mullens quickly feels the zone open up. Bourne gives a stutter move toward the out on safety Marcus Gilchrist (No. 31), who has outside leverage. He then cuts back inside toward the spot vacated by Whitehead. Mullens turns and fires a bullet right to Bourne in the middle of the end zone for his second touchdown pass of the evening. In what would become another highlight reel play for George Kittle, Mullens and he would connect for a 71-yard reception that would set up Kittle's touchdown catch a few plays later. From a three-by-one formation, Mullens motions Breida out to the right as the widest receiver, making it an empty three-by-two formation. There seems to be a lot of confusion at this point in the pre-snap by the offense with receivers looking around trying to figure out the play call (more on that in a bit). Kittle, as the innermost receiver in the trips formation, is running a stick-nod route as Garçon cuts underneath him, giving a quick high-low read to his left. On the offense's right, Goodwin as the slot receiver is running a quick slant. Mullens catches the snap and immediately the middle of the field becomes compressed. His eyes go right, getting the underneath defender to widen but he immediately takes away the throwing lane to Goodwin. No problem. 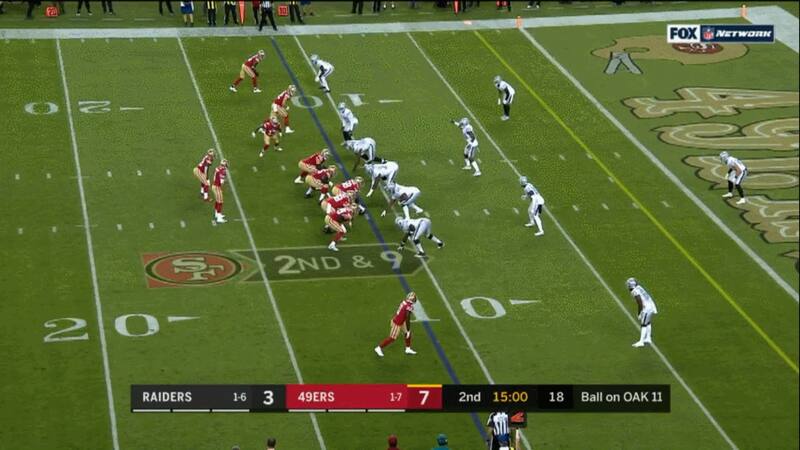 Mullens knows he has Kittle running the stick-nod and his eyes go left to locate him. As soon as he sees the window, he flicks his wrist and snaps a pass to Kittle across the middle into a tight window. Kittle makes a one-handed grab and ducks through two defenders on his way to a 71-yard gain. 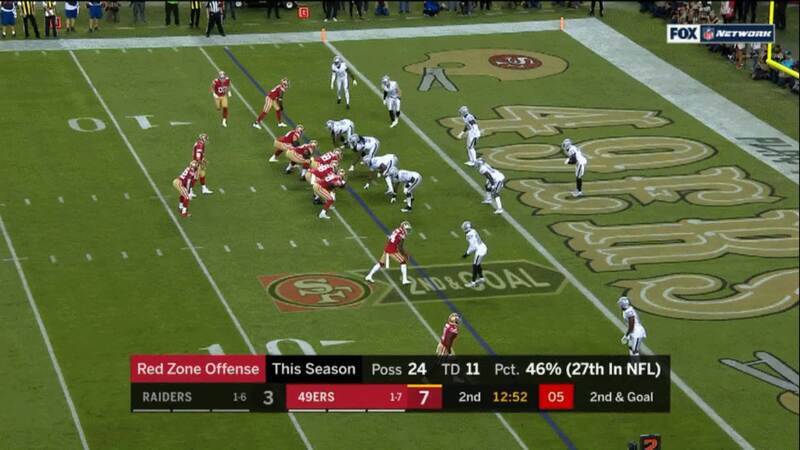 It was later revealed by Kittle the morning after the game on SiriusXM NFL's The Blitz that once in the huddle, the offense only got half the play call before the headset in Mullens helmet cut off due to the 15 second rule at which all communications with the player and coach are cut off. Mullens ended up just winging it and calling whatever he thought would be the next sequence in the play. The result was that Goodwin ended up in the same area as Kittle when the pass was thrown but due to Mullens looking off the defender, he created a window just small enough to fit a pass in. The biggest concern is that Mullens does not have the strongest arm and we saw glimpses of that in this game. He's going to need to be closer to perfect with his timing and placement like he was on several throws if he hopes to complete these passes in the future. On this throw to Garçon midway through the second quarter, Mullens has fullback Kyle Juszczyk running out to the flat while Garçon runs a deep comeback route. Mullens drops back and does a nice job of holding the underneath coverage in the middle of the field and preventing them from getting into the throwing lane. However, he holds them in their zone drops a little too long and as he comes back to Garçon, Garçon is already in his break on the comeback. Mullens throws the pass but it's a bit late and behind Garçon, allowing Worley to break it up. The pass also floats on him. Mullens rolls out to his right on this throw and it should be an easy throw as Goodwin is open on the sideline. He pulls up to throw but the pass is low and away from Goodwin, who can't hold on to it. On both of these throws in the future, Mullens will have to be near perfect in his timing and placement, which he was for the most part anyways with other throws he made throughout the night. The 49ers are no strangers to having a back-up quarterback come in in recent years and have dominating performances. Colin Kaepernick did it back in 2012 against the Bears. C.J. Beathard almost led the comeback in his debut against the Redskins last season. Jimmy Garoppolo came in and won five straight to close out last season. But not since Alex Smith in a 2012 Monday night Football game has a 49ers quarterback turned in that kind of performance in a prime time game. There have been numerous games like that since. What remains to be seen is if this was an anomaly or a sign of future things to come, possibly throwing a wrench into the quarterback plans going into 2019. For now, as of this writing, the 49ers have not officially announced a decision on who will start the upcoming Monday Night Football game against the Giants, though it's being reported by Ian Rapoport and Jay Glazer that Mullens will be under center. One constant in all of this though is that Shanahan is not going anywhere if he keeps devising ways to elevate the quarterbacks on the roster with the kind of game that he called and that Mullens executed against the Raiders. He never asks them to do anything they're not capable of doing, which is probably why we saw the playbook open a bit more with Mullens, indicating that Shanahan is one of the best coaches in the league and that Mullens may currently be the best quarterback on the roster.